Before you create any new content, be sure to analyze the raw content you already have available. Nothing works better to see what’s working with your content than looking at actual content behavior. Get better insights (and more of them). Fifty-three percent of B2B marketers are challenged by measuring content effectiveness, according to the 2016 B2B Content Marketing Trends—North America report from CMI and MarketingProfs. Since you can’t improve upon what you aren’t measuring, an advanced GA setup will enable you to make better decisions on which components of your marketing are working and where opportunities to improve exist. Save time. You’ll spend less time in Google Analytics, because your information will be served up just the way you need it. That means more time increasing the ROI of your content marketing efforts. In this article, I share 13 simple but strong ways to bolster your Google Analytics configuration and insights for content marketing. The list features must-haves for ideal setup (hint: the out-of-the-box GA default settings aren’t spectacular), better tracking (this can always be improved) and customized attribution insights (❤️ more data). 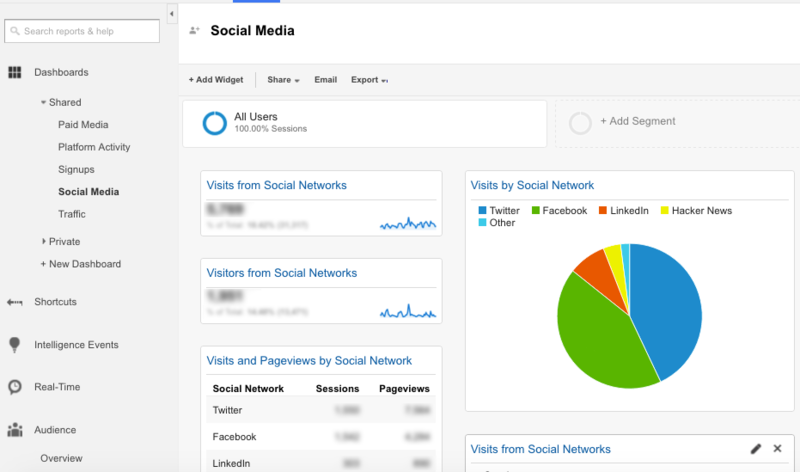 Let’s dive into some key Google Analytics setup configurations for content marketing. Some sites will have their own domain showing up as a referring site within Referral traffic. This can cause major inaccuracies for understanding user behavior on your website and the source where they came from and screw up your key metrics. Fortunately, this is an easy fix. Excluding your own domain as a referral tells GA to ignore self-referrals and attribute traffic to their true channels. Go to GA Admin > Property column > Tracking Info > Referral Exclusion List. Click the ‘Add Referral Exclusion’ button and add your domain. Within 24 hours Google Analytics will begin accurately ignoring your site as a referral/new user session. Excluding referring domains is also helpful if your site’s visitors go to an external payment processing site, such as PayPal, to complete a transaction. Adding PayPal.com to this list will regain your true acquisition sources on traffic and conversions. Accurate sources in Google Analytics are vital for measuring the success of your content marketing efforts, and using the Referral Exclusion List feature will help keep your sourcing clean. To enable valuable information about your audience to populate, such as demographics and interests, you must update Analytics settings to support Advertising Features. This means modifying tracking code and property settings, which also enables remarketing capabilities and other advertising reporting features. Follow these instructions if you’re using Google Tag Manager. Next go to Reporting > Audience > Demographics > Overview. Click the ‘Enable’ button. Within 24 hours, you’ll begin to see user data like age, gender and interest categories that will allow you to better understand who your site visitors are and improve your content marketing. Everyone agrees that one of the most important aspects of content marketing is knowing your audience. Unlock the Google demographics and interests data to begin supplying yourself with more information about your site’s users. If you find yourself viewing particular areas of the site often, like your blog or a particular subdomain, go ahead and create a filtered view to save time. Start by copying your main view by going to GA Admin > View column > View Settings. Click ‘Copy view’ and then give it a distinct name. The copying and then altering method is recommended, as this will maintain the same specifications you have set up with filters, goals, user permissions and more. You can also use this function to separate certain types of traffic from your main view if you wish. The example below is our Sandbox test environment traffic separated from the “actual” traffic to keep the data tidy. To build a view from scratch go to GA Admin > View > Main Dropdown. Click ‘Create new view’ and specify what you’re looking to see. Note: adding a new view instead of copying requires more settings to specify. Channel Groupings are rule-based groupings of your traffic sources. Throughout Analytics reports, you can see your data organized according to the Default Channel Grouping, a grouping of the most common sources of traffic, like Referral and Direct. Wouldn’t it be nice to tailor these a bit? You can regardless of the type of website you have. Whether your site is an ecommerce store like Wild West Pool Supplies or a niche B2B publication, Channel Groupings are easily customizable. Go to Admin > View column > Channel Settings > Channel Grouping. Click ‘Default Channel Grouping’ to begin permanently changing how Google Analytics classifies traffic moving forward. Listed are all of the ‘System defined’ channels of traffic like Organic Search, Social, Email, etc. To update your channel definitions to do things like differentiate Paid Social traffic from your Organic Social traffic, click ‘Define a new channel’ and then define the rules. Since all our paid social campaign destination URLs have UTM tracking codes, we can specify all visits via paid social using Source / Medium and entering the corresponding utm_source and utm_medium parameters for each campaign we create. Another Analytics channel that’s smart to create for content marketing is having Newsletter traffic isolated from general Email traffic. The key to customized channels in GA is determining what the unique identifiers are of the type of traffic you want to specify, and defining in the rules. As your marketing evolves with future campaigns, always check your channel grouping settings to ensure your traffic and conversion data is going where you want it to go. There are several ways of setting definitions; Source/Medium is easiest. Goals are ideal for measuring top content marketing KPIs like conversions, newsletter subscribers, ebook downloads and more. In Analytics, goals can be tracked with triggers like events or thank you pages. To create goals go to Admin > View column > Goals. Click the ‘New Goal’ button and specify the type of goal, description and details of what you want to track. A maximum of 20 goals is available, so make sure to use these for measuring only the most important actions users take on your site. Events are important user interactions embedded in content that can be tracked separately from a page load, such as call-to-action button clicks, video plays or text field entries. Google Analytics is great for drilling into the events completed by users on your site to get a better understanding of the actions being taken by your visitors. Go to Reporting > Behavior > Events to see the event data being picked up by Analytics. Organization is key! When adding events to your site’s code to track key actions, use a consistent and clear naming methodology for using the category, action, label and value, so the reporting is easy for everyone to understand without explanation. Hopefully you are using UTM tracking parameters in the URLs of your email and social media marketing campaigns. If so, then you can easily analyze the impact of your efforts, thanks to Analytics organizing all campaign data in an accessible way. Go to Reporting > Acquisition > Campaigns to see how they stack up against each other. This is a valuable view for seeing what content your users like best, what’s converting and which areas to focus more on. Let your audience inform you of what they are finding most valuable. Here’s where the fun begins. Analyze the data of certain members of your overall users by creating custom segments. These can be people who have interacted with certain pieces of content on your site including leads, customers — really, anyone you can think of. Building segments is easy. Go to Reporting > + Add Segment (top middle). Click the + New Segment button, enter a descriptive name like ‘Linkedin Traffic’ or ‘Branded Search Visits’ and fill out the options in the different categories to configure the filters you want. Time saver: Some of your custom segments will be similar to existing segments or other customs, so use the ‘Copy and modify’ feature for quicker building. More often than not, a user will interact with your site more than once before converting to a customer. Moz reports that on average, someone visits their site eight times before taking a free trial. Aside from creating helpful content, your job as a content marketer is proving the value of your content and crediting where credit is due. Custom conversions have the power to report the true effect your channels have on conversions that required multiple visits via multiple avenues. For example, you can create a custom conversion to see the total number of conversions that visited via organic search at any point throughout their buying journey, not just original source or last interaction. This data is a bit hidden in the platform. Go to Reporting > Conversions > Multi-Channel Funnels > Top Conversion Paths. Click on the ‘Conversion Segments’ button, then the ‘Create New Conversion Segment link. Name and define the segment accordingly. These will help you start attributing the the full credit your content marketing deserves. With so much capability and data, it’s easy to get super-granular in Google Analytics. Dashboards are a great way to zoom out, view a collection of your favorite reports and eliminate redundant clicks within your reporting. To begin populating a custom dashboard, go to nearly any report view and click the ‘Add to Dashboard’ button in the header of the page. Then select your widget type — meaning, however you prefer this data to be displayed (timeline, metric, pie chart, etc.). Creating multiple dashboards is easy to do and a great way to isolate key areas and channels such as Blog Traffic, Social Media, Conversions or Paid Media. Not all reports can be saved to dashboards, but fortunately there are Shortcuts. These act like bookmarks to save complex reporting views like data found in the Multi-Channel Funnels section. Click the ‘Shortcut’ button in the header of the page. Then enter a name, and your report will be saved in the left-hand rail just underneath your dashboards. If you run retargeting or paid search via Google and have your GA account connected to Adwords, you’ve noticed click and cost data gets automatically populated. But what about your paid social campaigns on Facebook, Twitter or Linkedin? Or paid search on non-Google entities like Bing? Importing click and cost data for non-Google campaigns makes it possible to compare the return on all of your marketing campaigns side-by-side. Go to Admin > Property column > Data Import. Click + New Data Set and follow the instructions around data details and schema. Note: campaign data in your upload should be broken down by each day. Once submitted, your uploaded campaign data will populate in your reports within 24 hours. Go to Reporting > Acquisition > Campaigns > Cost Analysis to see your sessions, impressions, clicks, cost, click-through-rate and cost-per-click data. Cost analysis helps simplify ROI of content marketing, but more importantly, it makes it easier to optimize your overall marketing spend. You know who else loves Google Analytics data aside from other content marketers? Stakeholders and members of other departments in your company. Chances are they’d love to see certain reports. Do them a favor and send them URLs of reports or dashboards they care about so they can bookmark them. Better yet, set up recurring report emails for them by clicking the ‘Email’ button in the header of nearly any report.